One of the most famous samurai of all time is Musashi Miyamoto (1584-1645). The word "legendary" doesn't even begin to describe Musashi. Born a low ranking samurai, he wandered Japan, challenging and defeating the greatest swordsmen of his time. He was so famous that legends and fables about him sprung up throughout the country during his own lifetime. A rash youth, Miyamoto grew into a Zen master, philosopher, painter, and the greatest swordsman in Japanese history. The life of Musashi Miyamoto was novelized by writer Eiji Yoshikawa from 1935 to 1939 for the Asahi Shimbun. Dubbed Japan's Gone with the Wind, a number of films were made based on the book (and on the historical Musashi himself). 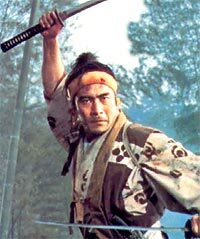 However, the most enduring of these are the three Zoku Miyamoto Musashi or Samurai films (often considered one of the first fully planned film trilogies), directed by Hiroshi Inagaki. Not only are they the most recognizable films on Musashi today, but they are the films that have had the most play in the west. One of the major reasons for this is Toshiro Mifune, the powerful actor known for his samurai roles. He takes the mantle of Musashi in these films, helping to create a tour de force epic that have enthralled film fans for decades. The first film, dubbed Samurai I - Musashi Miyamoto (1954), introduces Miyamoto and many of the characters that will populate the trilogy. 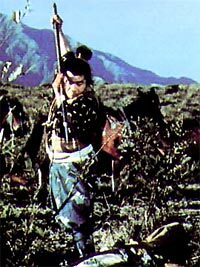 Miyamoto, known at the beginning of the film as Takezo convinces his friend Matahachi that they should participate in the (historical) battle of Sekigahara. Unfortunately, Takezo and Matahachi end up on the losing side. They are able to drag themselves out of the battle before being killed and take refuge with a widow, Oko, and her daughter, Akemi. Both mother and daughter fall in love with the strapping Takezo, but he rebuffs their advances. However, the weaker Matahachi falls in with the conniving widow. Takezo, on the other hand, attempts to return to his village. However, he's considered a traitor by the government and the village and is captured by the local Buddhist priest. Eventually, before his scheduled execution, Matahachi's betrothed (whom he conveniently forgets), the beautiful Otsu, takes pity on Takezo and lets him go. Recognizing Takezo's amazing abilities, the priest takes him to his friend, the local feudal lord in Kyoto, who grants Takezo samurai rank and a name, Musashi Miyamoto. Despite his love for Otsu, Musashi leaves the priest, Kyoto and her to travel Japan, to study and atone for his behavior as a youth. In Samurai II: Duel at Ichijoji Temple (1955) Musashi returns to Kyoto, where a kendo school targets him after he embarrasses them by wiping them out. This chapter introduces Sasaki Kojiro, a handsome young samurai who helps Musashi... for his own reasons. Sasaki is like a young Musashi - they both seek fame and glory and Sasaki's interest in helping Musashi is only so that the already-famous swordsman can become even more prominent. At the height of his reknown, Sasaki plans to duel and defeat Musashi, winning his glory. This film also introduces Jotaro, an orphan boy who tails Musashi (fortunately, he's not as annoying as the kid from say...Temple of Doom). While there are battles in this film, relationships also blossom. Akemi's mother plans marriages for the young girl, but the daughter pines for her Takezo. Otsu, too, waits in Kyoto, hoping that Musashi will return. Sasaki finds and falls for Akemi, but he refuses to substitute for Musashi in her affection. 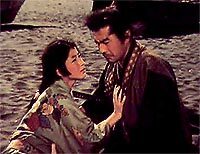 As this film closes, Musashi tries to express his love for Otsu, but instead shames her. He runs off in order to atone for his misdeeds, taking Jotaro with him. The final film of the trilogy, Samurai III: Duel on Ganryu Island finds Musashi giving up his wandering. The Shogun is seeking a teacher in the art of swordsmanship and he's interested in both Sasaki and Musashi. Sasaki uses Musashi's return as a chance to challenge the renowned swordsman. 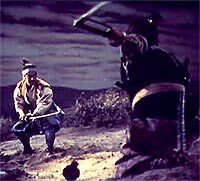 Musashi agrees to the duel, but postpones it for a year, which he uses to live on the fringes of a farming village, very much like the beginning of the first movie. Both Otsu and Akemi are able to track him down, which precipitates a major battle between Musashi's village and a group of bandits. After a year's time, Musashi meets Sasaki and the two rivals battle on Ganryu Island. Musashi excels on every level. Unlike many modern trilogies, which are made only because the previous film did well, Musashi is well planned out. Jotaro and Sasaki don't feel like they were dropped out of nowhere - their introductions don't feel forced. The music booms a gorgeous, heroic theme and all the actors are dead on. The cinematography is gorgeous, especially when Inagaki highlights the beauty of medieval Japan. Though it took nearly ten years after the original releases of the last two films to be released in the U.S., the stunning series is available now on three discs released by Criteria (who should really sell the three in one set, as it is one story arc). Samurai and classic film fans would do well to check out this trilogy, one of the most important films in both genres.